Bed bugs are pests that can get into every nook and cranny if left unchecked. These pests most famously favor hiding in beds and around sleeping areas, but they are not limited to that space. Successfully eliminating bed bugs requires attention not only to the bed, but all surrounding areas and a lot of places where you may not initially expect to find these creatures. To be confident that the bed bugs don’t return, it is best to carry out a thorough cleaning that will not only kill the insects, but prevent them from returning and ensure that their young don’t also cause you problems. Rubbing alcohol – Using rubbing alcohol is one of the most effective ways to instantly be rid of bed bugs. This option is limited however, as it means that the bugs need to be easily identifiable and you have to have found them. Cleaning bed linen – Once you’re aware that you have a problem with bed bugs, cleaning bed linen is one of the first steps to take to help get rid of this pest. Where possible, wash at over 115 degrees Fahrenheit. 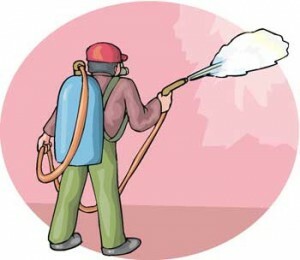 Pesticides – Getting professional assistance from an experienced pest controller at this point is also advisable, as they maybe be able to offer further advice and utilize stronger chemicals and insecticides than you may have access to. Vacuuming – Using a vacuum to get into every corner, along the edges of mattresses and in the hollows and any narrow spaces in the bed. It is also advisable to thoroughly vacuum all carpets, upholstery on furnishings and any loose rugs where the bed bugs could be hiding away. Dusting – When dusting, it may help to use something with alcohol in it to kill the bed bugs. Dusting needs to be done all around the bed area, in around bedside tables and drawers, including emptying and dusting in and underneath all the drawers and the underside of any cabinets. Headboards, walls and other places to eliminate bed bugs – As well as the more obvious locations, it is also important to remove any headboards and clean them thoroughly. Bed bugs will also hide in any cracks in your walls, between floor boards and under skirting boards. Steam cleaning in hard to reach places can help to eliminate eggs and bugs; while sealing cracks in walls and between floors and skirtings can also help to prevent the bugs from returning. In order to truly eliminate bugs effectively, it is important to consider the many different hidey holes that they can be found in. Managing the problem of bed bugs is best done through a number of different approaches. A comprehensive clean should begin by considering every possible place the bugs may be living, then progressively cleaning all of these locations, making use of pesticides where necessary and carefully cleaning and vacuuming bed linen and upholstered items. More posts like this one in Getting Rid of Bedbugs. Next post: How can I prevent bed bugs from spreading to my new apartment?